Before anyone tries these Ripe Plantain Cups w. Spicy Chicken and Avocado Mayo the question might arise in their mind if perhaps we don’t have too many plantain recipes. But only before. And we only have 21 plantain recipes so far. Nowhere near enough. This dish, my friends, is the thing legends are made of. If you’re a fan of ripe plantains — and if you’re not, perhaps you’re in the wrong blog — I can see how you’re already mentally making a shopping list. How your guests will ask why you didn’t make more of this (portion control, my friends! ), and how long before you invite them again. Word will spread out, and soon you’ll be having people asking when they can come by, “if you’ll be making ‘those’ again”. I’m warning you. When I test recipes, if things go well, I take some time to go through the second test (all our recipes are tested twice, at the very least, some several times). After all, I don’t want my family to complain about eating the same thing two days in a row. No problem of that kind this time. I made this on a Monday, and by Tuesday I was serving it again. Both times it flew off the table faster than you can say “holy plátano maduro, Batman!”. No complaints at all (except for that one about there being too little). Ripe Plantain Cups w. Spicy Chicken and Avocado Mayo Recipe: Juicy, spicy chicken on top of a bed of melted cheddar in a cup of sweet ripe plantains and drizzled with creamy, garlicky avocado mayo. It's a thing of beauty! Boil the plantains: Peel and halve the plantains, boil in a 2 qt [0.5 lt] pot with enough water to cover them, plus an inch" [2.5 cm]. Add 1 teaspoon of salt to the water. Once the plantains are cooked through (about 15 mins. ), remove from the water and discard water. Set plantains aside. Prepare filling: Heat one tablespoon of oil over low heat in a frying pan. Stir in onion. Cook and stir until it turns translucent. Add the bell pepper and shredded chicken and mix well. Pour in tomato sauce and simmer until the tomato has mostly evaporated. Season with salt and hot sauce to taste. 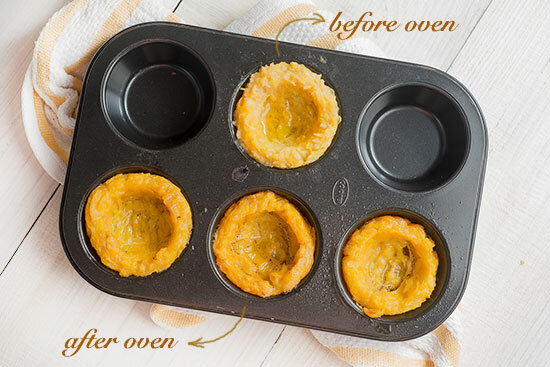 Form the cups: Grease 8 non-stick muffin tins with some of the oil. Lightly mash the plantains (do not make into a puree). Scoop eight equal parts into the greased tins. Using the mortar part of a mortar and pestle press against the tin forming the cups. Brush the plantain cups with remaining oil. Cook the cups: Heat oven to maximum temperature (you can also use a toaster oven for faster cooking). Place the muffin tins in the oven and cook until edges turn light brown (see picture). Remove from the oven. Divide cheese into the plantain cups, and press lightly. Scoop the chicken into the cups and return to the oven for another 5 minutes. Serve: Loosen the edges of the cups with a toothpick. Carefully remove from the muffin tins (a fork is best for this. Place the cups on a serving tray. Using a condiment bottle, drizzle avocado mayo on the cups. Sprinkle with cilantro. The plantains should be ripe but still firm, with partly blackened peel. Check out the photo in the intro to the recipe to get an idea. How do you make the seasoned tomato sauce? Me encanta el platano maduro! I love using the muffin tin idea! Can you do the same with green plaintan so I guess it’s fry it first to form the stuffed plantain cup? We did something similar with green plantains, check here. Yum! So easy to make. My family loved them. Gracias! Can this be made with unripe plantains? Molde para hacer las canasticas de platanos? Se que se puede usar Los moldes de muffins Pero me gustaria comprar Los que usan en DR. This is not a traditional Dominican recipe, so there is no traditional way of doing it. Hola Clara, con què arroz lo acompañarías? Que me sugeririas? Gracias! !